Last Friday, two young police officers guarding the Temple Mount in the Old City of Jerusalem were brutally murdered. They were both from the Druze community. Though not Jews, they dedicated and tragically lost their lives protecting the holy site. One of the officers, Kamil Shanan, was from Horfesh, a village up North, practically in Lebanon. Greater MetroWest adopted Horfesh in partnership 11 years ago, during the second Lebanon War. As a small non-Jewish village, it did not receive Israeli protection during that conflict, despite the fact that the rockets sent by Hezbollah did not discriminate between Jew and Arab. Our community stepped in to help them protect their residents. Since then we have partnered with Horfesh on numerous projects. And, according to the mayor, Mofid M’eri, our community’s decision to ensure that their small village had a security center put Horfesh on the map in Israel, so they wouldn’t fall through the cracks again. As soon as I heard about the tragic shooting last week, I contacted Amir Shacham, our Federation’s Associate Executive VP, Global Connections, to let him know that I would like to adjust the schedule on my upcoming visit to Israel to pay respects to Kamil’s family. After all, this is what family does. On Monday, Amir and I drove the long trip north directly from the airport. Kamil’s cousin, Nabila Shanan, and her husband met us and brought us to the family home where they were sitting in mourning for seven days (very similar to our shiva custom). Nabila coordinates the Youth Futures program we support in Horfesh to help at-risk youth succeed in the school system. She is part of our GMW family. When we entered the home, we walked through a receiving line, nodding our condolences to each of the relatives. Finally we met Kamil’s father. I shook his hand and extended my sorrow on behalf of myself and the entire GMW community. He warmly received us and expressed his gratitude. The mayor explained to him precisely who we were, and how committed our community is to the people of Horfesh. The mayor himself had lost his brother, a high-ranking IDF officer, who was killed defending Israel on the Gaza border. There are hundreds of stories like this of the Druze’s loyalty to Israel. 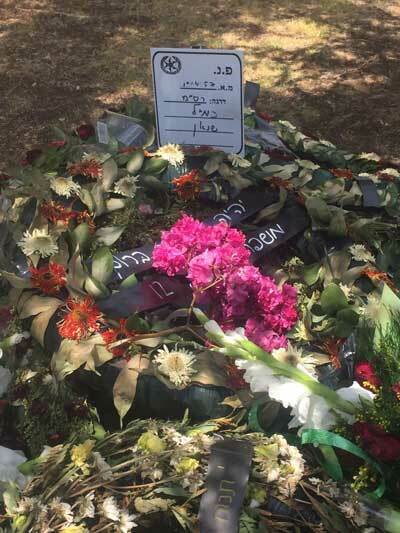 Clearly Israelis appreciate the Druze’s immeasurable contribution to the country, demonstrated by the fact that we were not alone in traveling a far distance to extend condolences. Kamil’s father told us that many Israelis had come from long distances to express thanks and solidarity. He also told us that Israel is the best host country in which the Druze live and that he appreciates our support and welcomes our friendship. As we were leaving, Nabila and her husband invited us to their home for coffee, despite their loss. Community comes in many shapes and forms. 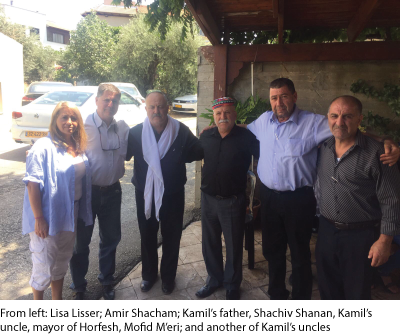 We at Federation Greater MetroWest are community with this Druze family. I was honored to represent us.